When we're introduced to the four stars of Babies, they’re still in the womb. But not for long. After a few moments of anticipation and preparation — they’re off! They’re screaming, groping, suckling, drooling, and crawling all over the place, discovering the world beyond their mothers' bodies. An extraordinary tapestry of stories begins. This is not a haphazard collection of sentimental home videos. It’s an attentive consideration of how babies encounter, learn, and grow in the world. And it’s a provocative display of differences in their surroundings, families, personalities, and cultures. We’ve been conditioned to see a lot of familiar sights on the big screen. Babies are not one of them. When we do see babies on the big screen, they’re included as blasts of cuteness; as comic relief; or, as wisecracking, special-effects-enhanced, diaper-clad versions of grownups. This movie is a welcome relief: It shows us a world in which babies play an important role. That is to say — the real world. The four spotlighted infants are remarkably different, but all compellingly watchable. Instead of making this a quest for cuteness, French documentarian Thomas Balmès — himself the father of three children — attends to these tiny individuals with a reverent care, as if every moment is sacred. Whether they're playing, posing, pounding on one another, or peeing, these babies are a joy to watch. We have Hattie, born in San Francisco to parents who are able to provide her with excellent care, exercise, storybooks, teaching, and equipment. Then there's Mari, born in Japan, whose well-to-do family gives her the best kind of upbringing the big city has to offer. Ponijao is born in Namibia, and spends her days crawling around in the dust under the watchful care of her mother and eldest sister, who is already raising children of her own. Balmès brings us in close to the sphere of each baby's immediate experience. The babies wriggle inside blanket-cocoons, run to the end of their tethers, fold themselves into family embraces, and strive urgently at their mothers' breasts. Adults seem like mysterious giants. The world is ablaze with bright colors. The ground is littered with objects that might become toys, might become trouble. And, unless they’re well-schooled in languages, moviegoers will have no more idea of what their parents are saying than the babies do. There is a startling intimacy to these scenes. I'm not just talking about close-ups of nursing infants. I felt a joyous feeling of liberation from the tyranny of narrative conventions, as human beings were allowed to be human beings, and animals were allowed to be animals. Dogs and babies lick each other. A Namibian mother cleans her infant's face with her mouth. An infant, lying down, pees freely into the air. I like what film critic Steven Greydanus says: "[Babies] is about families made up of people who have bodies. If your children have bodies, and are aware that other people do too, I see no real reason they can’t see this movie." Babies might have become a 90-minute episode of “funniest home videos,” in which babies take a hundred hilarious spills. And there are some spectacular accidents. But there is much to enjoy and consider in this movie. Violence! Bayar screams while his brother, Degi, whips him with a rag. Playing at rock-grinding, one Namibian infant struggles with another until the loser is left crying. It’s that forced kind of wailing any parent will recognize as an appeal for attention and justice … the kind that the wailer can shut off if she realizes there are more interesting things to do. Adventure! Mari explores an apartment, shielded from the elements, surrounded with possible playthings, and visited by a cat. Ponijao crawls through the filth, poking at flies, and when she finds a filthy bone, she sets about sucking on it — a behavior she may have learned from the dogs that prowl through the camp. A rooster visits Bayar’s bed, and a goat drinks his bath water. Ponijao learn to balance objects on her head and walk. Fashion! Bayar is wrapped in an elaborate, intricately designed, traditional costume. In the hospital, Mari is folded up in a blanket as if she’s a burrito. Ponijao and her family, quite comfortable with nakedness, make their bodies into living canvasses for vivid art, painting with bright hues of clay and dust. Hattie’s outfit gets the lint-roller treatment. Anatomy! Ponijao plays with a baby boy, noticing certain intriguing similarities in their design. This scene cuts immediately to the sight of a baby girl, all alone, playing with geometric shapes that seem to hold a profound mystery for her future. The juxtaposition of these moments makes wonderful sense. The differences in their environments, circumstances, families, and cultures deliver striking contrasts. Babies left alone express themselves dramatically as they experiment with their surroundings. Those with siblings have interactive adventures, sometimes looking at one another in a sense of shared wonderment. While these families represent a wide range of economic situations — some enjoying life with a plethora of privileges to choose from, some seeming to enjoy life quite differently with only life's necessities at hand — it is clear that the one thing all four children have in common is the gift of love from their families. Fortunately for moviegoers, Babies never turns into any kind of propaganda. Those who reduce the movie to some kind of pro-life ploy only reveal their own narrow-mindedness. This is a movie full of babies, pure and simple, and this addresses a significant deficiency for moviegoers. When was the last time you saw a film in which an infant was something more than comic relief, something better than a diaper-soiling inconvenience to adults? I can think of a few, but only a few. If more artists would take children seriously in their work, depicting a world in which all human beings — older than 40, younger than 4 — are created equal, we might begin to see children treated with greater care and compassion. We might be more careful with the world they’ll inherit. And we might be humbler, remembering just how dependent we were, once upon a time. We might realize that we will be dependent again on these rising generations, who will determine the shape of the world in which we’ll grow old. But let’s face it: It's easy to disregard what remains unseen. It's easy to stop believing that human beings, in the earliest stages, out of sight and out of mind, are of any consequence. But according to Christ, the meaning of life is closely related to our understanding of children. When we meditate on the mystery, individuality, and vulnerability of these little ones, how can we come away unchanged? All stages of human development and behavior deserve contemplation. Our culture, obsessed with declarations of personal independence, preoccupied with glamour, eager to present ourselves as gods, would do itself a favor by spending more time watching babies. And watching Babies! What’s your favorite film about babies? What did you think of Thomas Balmès' film, Babies? See responses below. Posted October 5, 2010, at 5:15 p.m. I got this for my daughters, ages 6, 5 & 2, to see in preparation for the birth of our next child in a few months. It was such a wonderful experience to watch with my girls; I wish it had been around for my older 2 to see before their younger sister was born two years ago. Sensitive things are easier to explain when their occurance is anticipated rather than in the middle of a hectic day. Posted May 17, 2010, at 10:36 a.m. 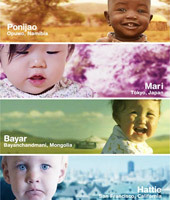 BABIES is a beautiful depiction of exactly what the title describes: BABIES! The music is enthralling, the cinematography breathtaking, and the subject matter relevant to us all. The lack of words throughout the film only adds to the beauty as words are not needed. Highly, highly recommend! Posted May 7, 2010, at 4:05 p.m. I don't see too many movies anymore, mostly because I find the majority really, really boring. (Even the "blockbusters.) I can't wait to see this one -- and take my 10-year-old. I think I better know a bit of what she's in for, though, regarding the more earthy parts. Posted May 7, 2010, at 3:48 p.m. I wanna see Babies tonight!! !